Chewy, crunchy, and unbelievably satisfying, this awesome oat bread might just become your new favorite. It’s amazing toasted! Baking with yeast makes my knees shake a little. For me, it is always hit or miss. I’m working on it. I WILL NOT LET YEAST DEFEAT ME. I won’t! It’s totally doable, and if you’re in the same boat as me (nervous Nelly), have confidence! We can do this! Regardless of my ongoing battle with the stuff, when Red Star Yeast contacted me about their new product, Red Star Yeast Platinum Superior Baking Yeast–a yeast they call “forgiving” and “simple to use” I was alllll about it. They promised it would give me “professional results EVERY time.” And let me tell you–this oat bread with cranberries and walnuts tastes like something out of one of your favorite bakeries. They added dough improvers to make your bread turn out even more perfectly. They recommend it especially for whole grain dough which is fantastic because I prefer to make whole-grain breads any time possible. 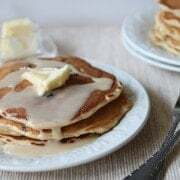 There is also helpful information on their website about how to use the yeast and lots of great recipes to get you started! Let’s just say I’m sold. 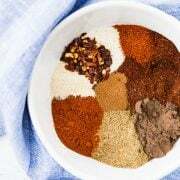 In the bowl of a stand mixer, combine Platinum yeast, one cup flour, oats, cinnamon and salt. In a large measuring cup (or small bowl), combine water, oil and syrup. Heat to 120-130 degrees F (I did this in the microwave!). Add liquid ingredients to the dry mixture in the mixing bowl. Using paddle attachment, beat on medium speed for 4 minutes. Gradually add in the remaining flour and knead with dough hook 5-7 minutes or until smooth and elastic. Add in the walnuts and cranberries and knead gently by hand until combined. Place dough on lightly floured surface and punch down to remove air bubbles. Form into a (approximately) 14 x 7-inch rectangle. Starting with the short side, roll up tightly to form a roll. Pinch edges and ends to seal. Place in a greased 9 x 5-inch loaf pan. Cover with a clean towel and let rise until indentation remains after touching. Meanwhile, preheat oven to 375 degrees F. Unless your dough is rising in the oven. Then wait. Bake at 375 degrees F for 30-40 minutes. Remove from pan and let cool before slicing. Oh…and that goodness that is spread on the oat bread? 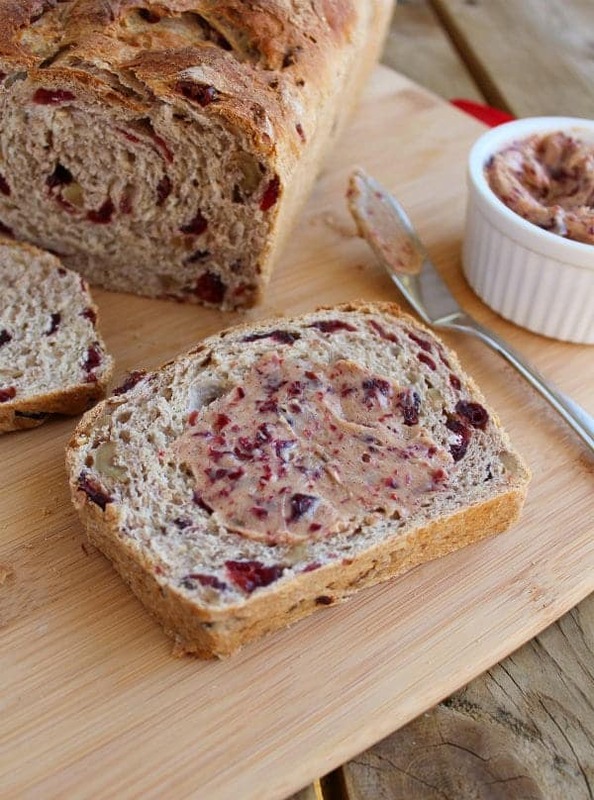 It’s a phenomenal cranberry butter that complements this bread perfectly. It has cinnamon and honey and it’s just incredible. Verdict: Best bread I’ve ever made. Seriously! Tasted amazing toasted, it really brings out the flavor of the walnuts. Husband’s take: Not the biggest fan of dried cranberries but he loved this bread and ate it every day until it was gone! He adores homemade bread. Difficulty: If I can do it, you can do it. Disclaimer: This post is sponsored by Red Star Yeast but all opinions, as always, are 100% my own. Hello, can you provide the ingredients in weight (ounces or grams)? Sorry, I don’t have the measurements in weight for this recipe. I made this bread in my early days of breadmaking, and now four years later I’m still making it! It’s so good. Thanks for sharing this! I’m making this bread for the 2nd time, delicious! Also with a smear of orange marmalade! I’m so glad you like it! Thanks for taking the time to come back and leave a comment and rating! I bet it’s fantastic with orange marmalade! Can this be made in my bread machine? I got a new one for my birthday and am looking for good recipes…. I haven’t tried, but I bet it would work! Well, I made it. It has to be one of the best bread recipes I’ve ever come across. My wife and I absolutely love it. I’m inclined to make a loaf every weekend because it goes fast. But she insists I go easy because we’re both a tad plump as it is. Making a second loaf today. Dont be afraid to let it bake until the crust turns a nice brown. I decided to sprinkle a touch more water as I kneaded it because the dough seemed I little stiff. And I used honey instead of maple syrup. And diluted with water to match the volume and consistency. It turned out perfect. Throwing in some blueberry and raisins with the cranberries this time. Cant wait. Thank you so much for the recipe and easy instructions. So happy you loved the recipe! Thank you for your thoughtful and helpful comment — can’t wait to try it with blueberries, yum! The yeast you have should be fine! :) Good luck! I just saw this on the platinum red star yeast site-looks very very good and I plan on making it asap. I just bought some of that yeast. AND I see a lot of people commented on it – mostly saying they are following you- not sure they actually baked it. Or they are looking for free give aways? BUT I have to say that recipe is badly written. its just so hard to follow. The ingredients are not in order of how they are used so you have to keep looking back and forth to follow it. Then double check to make sure you have not missed anything. Sorry to be a crab, but I have edited some cookbooks and this recipe looks like a winner. Hi, just wanted to let you know that this has become a staple in our house…I was looking for a bread with oats and walnuts and happened upon this page somehow–I make this probably every two weeks now! Thanks so much! I so appreciate you letting me know! I’ll look into it. Thank you so much!! I’m so happy to hear that, Deb! I need to make it again asap. Rachel, what would be the best way to wrap, package, give as a gift? plastic or paper bag for the bread and I love the sealed containers for the butter, but I’m looking for something a lil cheaper…. I’m making about 8 loaves as gifts, any ideas or help is greatly appreciated! Thanks for an awesome recipe, Merry Christmas. I would let the bread cool completely and then wrap in plastic, unless it is going to be given/consumed the same day, then go for paper. Or do paper and tell them to put it in a plastic bag if they aren’t planning on eating it the same day. I’d say the cheapest thing for the butter would be to make little logs of it in parchment or wax paper, roll it up and tie the ends with some cute ribbon, and then chill it well. So fun that you’re using this for gift giving! Hope everyone loves it! Merry Christmas! I love baking with yeast and making bread. It looks like yours turned out perfectly. Cranberry pecan bread is one of my favorites, but I bet it’s great with walnuts, and oats sound like such a nice addition. I snagged several packets of that yeast when I entered the fair this year (they always offer free Red Star yeast to those entering the baking competitions) and have used it a couple times and I love it too! But I still haven’t located it in stores. I hope we get it soon b/c I’m sold on it. Speaking of which, I’m totally sold on this bread! So pretty! I bet chicken salad sandwiches would be amazing on this too. Mmmm The Cranberry walnut oat bread looks fantastic! I “like” Red Star Yeast on Facebook. I follow Rachel Cooks on Twitter (@SPLemonade). I follow Red Star Yeast on Twitter (@SPLemonade). I would love to bake some sandwich bread with Red Star yeast! Liked red star yeast on facebook! That Cranberry Walnut Oat bread looks yummy. I might have to try that! Also pizza. and maybe some cinnamon rolls! Would love to make the bread from recipe here :sounds delicious! I would make this for sure! Sounds almost identical to the bread we loved from our local supermarket, Price Chopper, but the y discontnued it suddenly almost two months ago and we cant find a good replacement anywhere! Cant wait to try this! Cinnamon Rolls for sure!!!! Yum! I would make cinnamon rolls. Can’t wait to try the cranberry and walnut oat bread. Looks YUMMY!! I’ll give it a try , I follow Rachel Cooks on Pinterest. (My computer had a freak out moment, so I apologize if this is a duplicate entry). I would make loaves of bread so I could stop purchasing the store bought loaves found in the bread isle. I actually plan to do this soon as homemade, fresh bread is tastier/healthier than the stuff bought at stores. I would love to make the featured cranberry bread with red star yeast! I made bread bowls with my yeast..and filled them with ziti..and rebaked..SOOO yummy! I’d like to try this yeast on my raisin bread recipe! I alerady follow on facebook. I bake Naan on a weekly basis and have had various levels of success so I would love to try the red star and see if it is more consistent! I dont know how to twitter! :( Im sorry! I would bake homeade bread and biscuits. Ive never been able to get either to rise before. This summer I wanted to learn how to make biscuits, so everyday I tried a different recipe and everyday I made beautiful new hockey pucks! I finally gave up and bought some from the store. My kids still laugh about our biscuit summer!! We like cinnamon rolls in our house. Homemade is always better than store bought. And last but not least I have “liked” Red Star Yeast on Facebook! I love using this yeast and this recipie looks so good Im going to have to go buy the ingredents to make it. I have “liked” your page on Facebook! I liked red star yeast on facebook! I follow Rachel Cooks on Pinterest. I also am now following your RSS feed! Follow Red Star Yeast on FB. I would bake so much honey wheat bread! And anything else I can think up or find online! The cranberry-walnut bread looks amazing!! Crossing my fingers that I win this amazing contest!! I follow @rachelcooksblog on Twitter. I would bake outside my comfort zone and try more fruit breads. I’m currently stuck in a whole wheat sandwich bread rut. I added you to my email account and I love that cranberry walnut bread. Im anxious to try it, because ive never been able to bake bread! Yum!!! I would make my guys homemade orange rolls. I like Rachel Cooks on Facebook . I would make some bread. Your bread looks great! I would use the Red Star Yeast to make homemade white bread. There’s nothing like the smell of fresh bread baking! I would make my own bagels! I want to try just some simple sandwich bread. The “perfect” recipe still eludes me. I friended Red Star on FaceBook. I subscribed to you on Google Reader. I would initially bake good ole white bread with Red Star because, now that I’m retired and have time to pick up baking again, I crave home made white bread like my grandma used to make. I would bake cinnamon rolls! YUM! I signed up for your emails…and confirmed! I like Rachel Cooks on FB. I would make cinnamon swirl bread…my family’s favorite! I now follow Red Star Yeast on Twitter. I have also “Liked” Rachel Cooks on Facebook . We just moved away from Texas, so I would make some kolaches! I follow Rachel Cooks on Pinterest, and pinned this recipe. I think I would have to make this bread, it looks just about perfect! I follow Rachel Cooks on Twitter. I follow Rachel Cooks on Facebook. I’d bake bread with this amazing new kind of yeast! I also like Red Star Yeast on Facebook! This bread looks so good! I think I would make yeasty pumpkin waffles because they’d be so very seasonally appropriate! I would love to make my homemade cinnamon raisin rolls with Red Star Platinum Yeast. I would definitely try making this bread, plus I have a challah recipe I sometimes make. I would make Christmas Stollen or Cinnamon Rolls. I would make sour dough dinner rolls or sour dough cinnamon loaf. I use Red Star Yeast only and look forward to using their new product especially with the holidays coming when I bake a lot. Oh my gosh, that cranberry bread looks amazing! I use it for bread. I use it for cinnamon rolls. I use it for pizza crust. I use it for soft pretzels. I have seen that Platinum yeast and now, I know, I need to buy it, pronto. I would first make cinnamon-swirl bread or cinn buns! I would bake some Banana Nut Bread platinum yeast. I would make cinnamon rolls for my kids just how my mom use to make them. HUGE covered with melted cinnamon and sugar with walnuts. Just melt in your mouth goodness and all home made. Nothing compares! I would make cinnamon rolls for sure. I follow @Rachelcooks on Twitter. I like Red Star Yeast on FB. My Dad used to drive a delivery truck for them back in the 60’s when I was a kid. Long time fans of Red Star Yeast. I follow Rachel Cooks on FB. I would bake my mother’s country crust cinnamon bread although your bread looks wonderful too. I added myself to your e-mail list. I love to bake so choosing something I would make with the yeast is difficult, but I definitely want to try the cranberry-walnut oat bread because it sounds delicious! Follow @rachelcooksblog on Twitter. I can’t cause I have no Twitter account. I would make cinnamon rolls first then potato bread! I’d make croissants. I’m dying to try them, but very intimidated. I have Pumpkin Pull-apart Dinner Rolls that I make that I’d love to try with this yeast. I bet it’d make a big difference in how they come out. “Liked” Rachel Cooks on FB! I already follow Red Star on Facebook. That’s how I saw your blog. I don’t Tweet, but I liked you on Facebook. I love making dinner rolls & breads – and I’m trying to get into whole wheat baking. So Red Star yeast would be great for that! Like Red Star on FB. Wonderful stuff on your Facebook Page. This recipe looks great. I have found a new love for baking breads. This bread looks divine, I would really like to try making this! I love baking french bread and fresh loaves of white bread this time of year (we’re in WV, and it is getting chilly!) to have with batches of homemade soup, Delicious!!! Thanks for letting me register for your give away. I love the recipe for Cranberry bread, might just try that soon. I already like Red Star Yeast on Facebook. I would make regular white bread. We love that. I might try whole-wheat bread. I’d make my famous Grandma Annie’s Homemade Pizza. My grandmother’s recipe from the old country! I’d make homemade cinnamon rolls! Yumm! I think I would make some really nice rolls! I did all the extra entries also! I would bake this bread, it looks fabulous with a nice crusty crust yum!!!! You have so many yummy recipes but of course this looks great and I love cranberries. Already like red star yeast on fb. I would make challah with the platinum yeast. “Liked” Red Star Yeast on Facebook. Following Red Star Yeast on Twitter. Following Rachel Cooks on Pinterest. “Liked” Rachel Cooks on Facebook . Would love to bake some basil brioche with the Red Star Platinum! I “Like” Rachel Cooks on Facebook . I would make some pizza dough with the Red Star Platinum. I would bake the famous No-knead bread from the nytimes. Thanks Katrina! Your creation was too! I would definitely bake your Cranberry_walnut Oatmeal bread with the Red Star Yeast. Looks delicious. Gorgeous! I am making this asap! Great looking bread! Think I would like to try it with dried blueberries and some grated lemon rind! Maybe if I win this, I will also overcome my fear of yeast baking! You’ve convinced me to try it. I’m so scared of yeast and baking. This bread looks fantastic! Your bread is beautiful – it turned out so well!!! There is nothing better than home made bread! I would bake pizza dough or pita bread! Oh. my. gosh. I need this bread in my life right now. 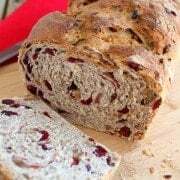 I would love to try this cranberry bread recipe. This bread is absolutely beautiful! I think a slice would be the perfect start to my day!! I’d love to make garlic knots because my dad is in love with them! Subscribed to your RSS feed ! I would make homemade cinnamon rolls. I “like” rachel cooks on facebook! I do love the Platinum yeast! It works so great and this bread looks fantasitc! I would bake my own pizza dough…and probably this bread! This is a gorgeous loaf! i would love to make cinnamon rolls ! 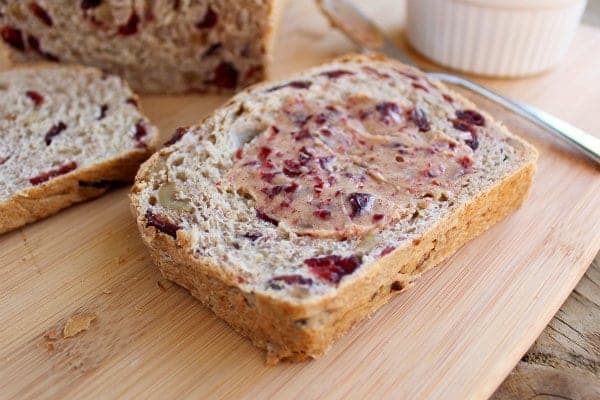 I would bake Cranberry-Walnut Oat Bread…looks so yummy! I liked Red Star Yeast on FB! I would make cinnamon raisin bread for sure! I would make cinnamon raisin bread! I would make pumpkin cinnamon rolls! I’d make naan – it’s my favorite and so easy! I would bake cinnamon rolls! this bread looks fantastic! i’m dying to make some cinnamon raisin swirl bread! I also liked Red Star Yeast on FB. I’m following Red Star Yeast on Twitter. I’m following you on Pinterest, too. I subscribed to your email subscription and already confirmed the request! I’d make my mother-in-law’s recipe for sandwich bread. My fiance can’t stop asking me to try and make it! I like Red Star Yeast on FB. I would make my pizza crust. I tweeted about this great giveaway. I’d use the yeast to make pizza dough! I would make pizza!!!! and bread… and cinnamon rolls… !!! I would make pizza dough. I follow red star on fb. I follow on pinterest as labellaluna. I follow you on fb..
Cinnamon Rolls, Christmas Breads, and my Hungarian yeast torte. Your bread looks perfect! What would I make, probably some wheat bread. I have a recipe I really want to try, but haven’t don it yet. I also just figured out RSS Feeds…so I subscribed to yours as well! 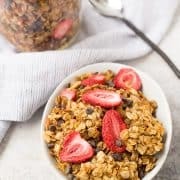 I follow Rachel Cooks on Pinterest! I follow Rachel Cooks on Twitter! I would make this bread…when I can get some Red Star Platinum! I’d actually be holed up in my kitchen making EVERY kind of bread! I follow on the RSS feed…. I’m already following @rachelcooksblog on Twitter. I Follow Red Star Yeast on Twitter and left a tweet. I Follow Rachel Cooks on Pinterest and left a pin. I Follow @rachelcooksblog on Twitter and tweeted this giveaway. Follow Rachel Cooks on Pinterest. “Like” Rachel Cooks on Facebook . I have been a subscriber to Rachel Cooks via email. I would make bread, I have bread recipes from around the world. We love our bread. I would make either a sourdough bread or chocolate chip loaf.. hmm, decisions decisions? I would make this bread! Sounds SO delicious! I am going to try this recipe. I grind my own grain and have the winter white wheat. If only I had that Red Star Platinum yeast right now, this would be the first thing I made (although I’m thinking that old whole wheat recipe that tasted so good but was *very* heavy will be an excellent use of it). TTFN–I’m on my way out the door to buy dried cranberries. A couple of slices of this bread and a pot of tea sound perfect for a grey, rainy day! I subscribed to your RSS feed, can’t wait to see all the yummy things that pop up. I would bake some pumpkin sweet rolls. I love everything pumpkin, it’s why fall is my favorite time of year. I’ve recently started baking with yeast and have some ups and downs for sure. I’m with you, I won’t be beaten by yeast! I keep trying and keep learning. But I must say, yeast that makes it easier to be successful, um yea I’m all for that! Your bread looks amazing and it is right up my flavor alley so it will be on its way into my oven soon! And of course, I had already “liked” Red Star Yeast on Facebook! That’s how I found you! I am following Red Star Yeast on Twitter! I “like you on Facebook! I would make this bread! It sounds perfect for me and looks amazing! What wouldn’t I make with Red Star Yeast? I’d probably start with a good sandwich roll. I AM making this bread! As soon as I can get some Red Star Platinum! Cranberries?!? Yes. Please. I would make yeasty rolls…yummy!!!! This recipe sounds awesome! I would try this, but I also make other types of bread at this time of year! would like to get my husband to make some more of his homemade kolaches. hes a chec so he makes the real fruit ones. 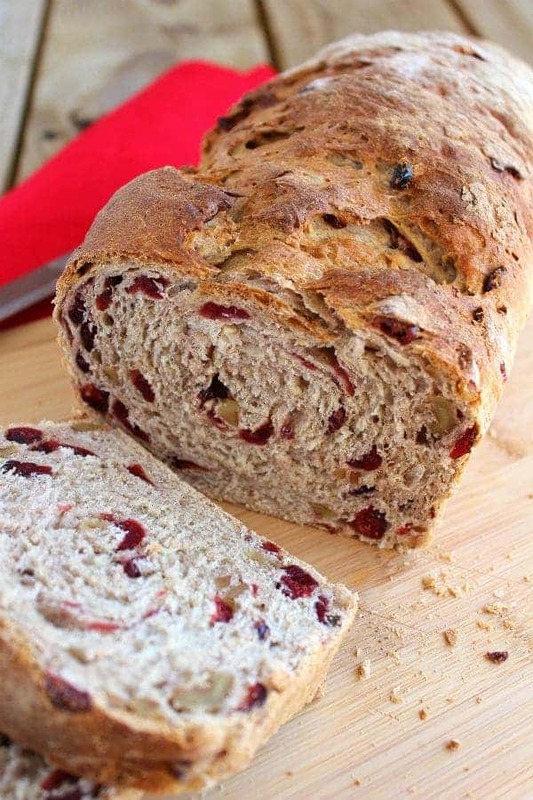 If I won I would have to make this Cranberry Walnut bread. It looks SO GOOD! I have been trying homemade white bread lately and would love to try this yeast! The cranberry bread looks amazing! Now following! This bread looks so yummy! I think this would be the first thing I would make with Red Star Platinum. I would definitely make that bread! serious YUM. And I have only done it once but I made really good dinner rolls for Thanksgiving last year. I might try that again. This bread looks mouth-wateringly delicious! I like RSY on FB. I would make this bread. I’ve been looking for a cranberry walnut bread recipe. Thanks! 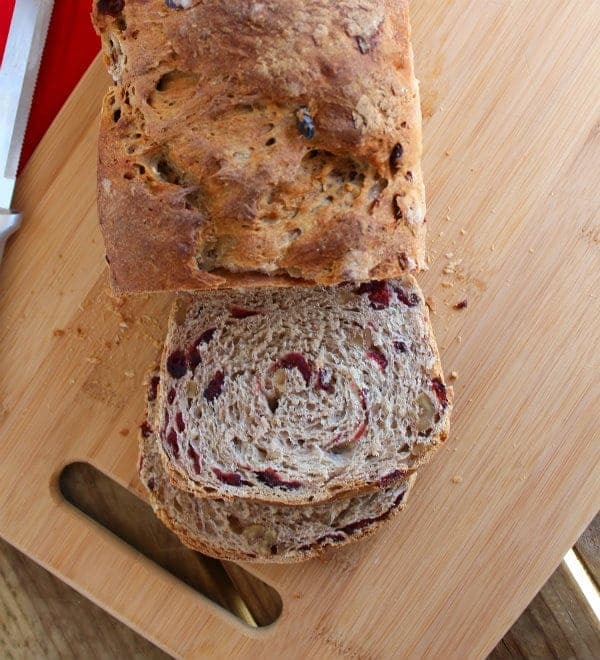 I would bake that Cranberry oat bread you made….it looks delicious! I would make some brioche bread. I love that stuff! I would make cinnamon rolls, the cooler mornings just call out for them! What a perfect bread for this time of year. I love it when someone says, “this was delicious!” Now I can’t wait to try it.